1 - Sambucol ($13.99) used $4/1 MFC and $10/1 Easy Saver("ES") = FREE ! 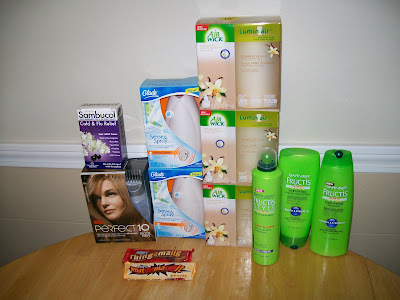 2 - Glade Sense & Spray ($7.99 ea) used two $4/1 MFCs and $4/1 ES coupon (scans twice) = FREE! ***I also received $6.29 back from buying the wrong Blink eye drops and returning them- this amount will be added back into my budget. Tee hee...did you see my Wags post? We both got hubbies candy bars! lol. Great job there, btw! Your Clairol didnt beep? If it does not, then I will definitely be back for some more of those with theoverage! I am in awe of your shopping abilities! I just started a new blog dedicated to deal hunting, and I'm going to post your button on that site. After seeing your post for Walgreens, I'm thinking I better make a trip tomorrow. Thanks for posting. did you use the B1G1 sense and spray and lasting impressions yet?? When you use one of those, and get 2,it's 4.01 overage! It did beep but the cashier pushed it through. I KNOW! We have 9 Walgreens in town and I've been in and out of 7 of them searching for the glade air fresheners. I've lucked out several times--I have 18 right now. Hahah! Most of the cashiers scrutinized the coupons and didn't allow the overage, but a couple did!